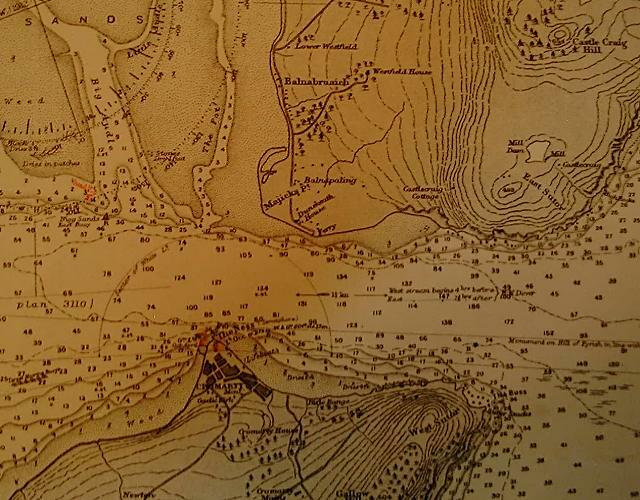 This is an old ships chart that was produced from a survey of the Cromarty and Moray Firths by HM Surveying Ship �Research� in 1898. The chart had been updated over the years with this issue being dated 1912. The full chart covers the whole of the Cromarty Firth and the west side of the Moray Firth down as far as Fortrose. The alignment shown for shipping entering the firth is to line up the �monument on the Hill of Fyrish in line with Invergordon Free Kirk spire and open of Cromarty�. The wreck of the Natal is not marked so the chart pre-dates 1915. Target mooring buoys are marked to the west of Cromarty and the maximum depth shown is 186 feet midway between the Sutors. And the Sutors were then the East Sutor and the West Sutor (not North and South). The Admirality changed the names just after this. picture #588 is the 1896 ordnance survey, which refers the 'North Sutor'. Were there fixed names at this time?